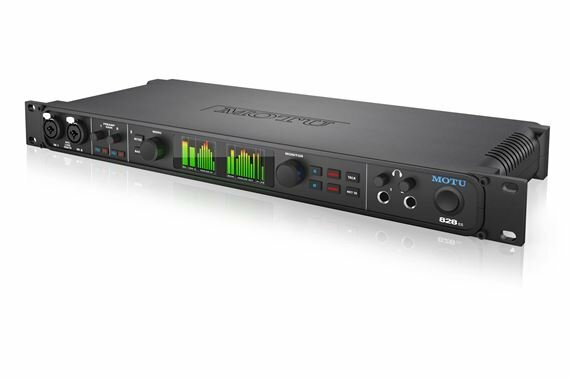 Order your MOTU 828ES Thunderbolt and USB2 Audio Interface from AMS and enjoy 0% Interest Payment Plans, Free Shipping, Free Extended Warranty & 45 Day Money Back Guarantee. Redesigned with renowned ESS Sabre32 DAC technology and new dual full-color LCDs, the Mark of the Unicorn 828es Thunderbolt and USB2 Audio Interface delivers everything you need to turn your computer into a powerful 24-bit/192 kHz digital audio workstation. New dual-LCD design: Two full-color LCDs display all signal activity at a glance with detailed metering for all analog and digital I/O. Access hardware settings from a simple and convenient menu. Superb analog audio quality and high-end converters: Renowned ESS Sabre32 DAC technology delivers 123 dB dynamic range and the same proven, award-winning audio quality as MOTU's flagship 1248. Ultra-low latency and proven, high-performance MOTU drivers: Round-trip latency (RTL) performance as low as 1.6 ms at 96kHz over Thunderbolt with high-performance DAW hosts. Universal connectivity: Connects to your computer with Thunderbolt, hi-speed USB 2.0 or AVB/TSN Ethernet for up to 256 audio channels (128 in and 128 out). Class-compliant firmware and industry standard drivers work with any audio apps. Connects to an iPad with a standard camera connection kit (adapter). 60 simultaneous audio channels: 28 inputs and 32 outputs, including two mic preamps with sends, 8 TRS analog in/out, separate main outs on XLR jacks, two banks of optical, S/PDIF, MIDI in/out, time code in/out, word clock I/O, and two front-panel headphone jacks. DSP mixing and effects processing: Flexible 48-input digital mixer with 7 stereo aux busses, 3 groups, access to 32 network inputs, and DSP effects, including reverb, 4-band EQ, gate and compression. 32-bit floating point processing: The 828es mixing and effects DSP engine delivers virtually unlimited headroom and the utmost in sound quality. Modeled vintage effects processing: Classic reverb. Compression modeled after the legendary LA-2A compressor. EQ modeled after British analog console EQs. Flexible matrix routing and splitting: Send any input to any output, or multiple outputs. Includes routing to and from the computer, plus any devices on the AVB network. Stand-alone operation with wireless control: Connect an Apple Airport or other Wi-Fi router with a standard Ethernet cable for wireless control of device settings, powerful 48-channel mixing and DSP effects. Web app control from any device: Control everything from your favorite web browser on a laptop, tablet and smartphone connected to your local Wi-Fi network. Precision Digital Trim: Digitally controlled analog trim on all analog inputs (mic/guitar inputs + quarter-inch TRS inputs) provides accurate adjustments in 1 dB increments. Control room features: Built-in talkback mic with front-panel "talk" button and"A/B" speaker select buttons. System expansion: Add a 2nd MOTU AVB-equipped interface with a simple CAT-5e ethernet cable. Connect up to five MOTU interfaces using a MOTU AVB Switch (sold separately). AVB/TSN audio networking: Build a network with multiple interfaces and computers using standard AVB/TSN switches and network cabling, with ultra-low network latency, even over long cable runs (100 meters point to point). Stream hundreds of audio channels among devices and computers on the network. Redesigned mic channels: Cutting-edge components deliver ultra-transparent sound with -108 dB THD+N, 118 dB dynamic range and -128 dBu EIN. 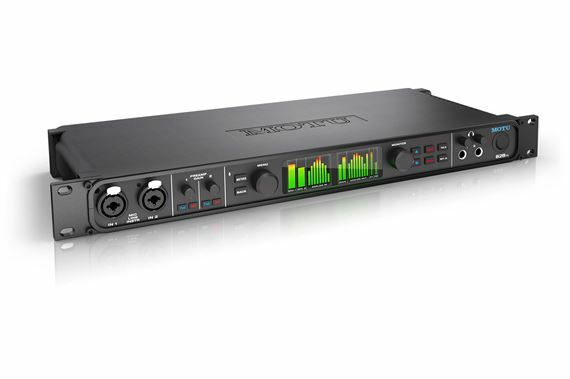 Each mic channel provides individual preamp gain, pad, 48V phantom power, digital remote control and analog (pre-converter) sends for mono or stereo outboard processing. Two headphone jacks: Each headphone output can be programmed with the same or different mixes, with independent front-panel volume control. Two banks of optical I/O: Connect outboard digital processors, digital mixers or other gear. 16 channels of ADAT at 44.1/48 kHz, 8 channels of SMUX at 88.2/96 kHz or 4 channels of TOSLink (optical S/PDIF) up to 96 kHz. Mix and match formats among in/out ports. Foot switch input: Connect a standard foot pedal switch (sold separately) for hands-free punch-in and punch-out while recording. Or map the pedal to any keystroke function in your host software. Time code support: Dedicated time code input and output jacks. Converts SMPTE time code (LTC) to MIDI Time Code (MTC) and passes MTC on to any MTC-compatible host software. MIDI I/O: Connect MIDI gear without the need for a separate MIDI interface. Direct Digital Synthesis (DDS): DSP-driven phase lock engine and internal clock source produces imperceptibly low jitter characteristics (below the noise floor), even when the 828es is resolved to an external clock source via SMPTE time code. DC-coupled TRS outputs: Use the 828es to manipulate and sequence voltage-controlled modular synthesizers from a host DAW. Instrument tuner and audio analysis tools: Includes an oscilloscope, real-time FFT, X-Y Plot, and graphic phase analysis. AudioDesk: Workstation software for Mac and Windows with 24-bit recording, sample-accurate editing and 32-bit mixing and mastering. The MOTU 828es is equally well-suited for studio and stage, with or without a computer. As an interface or standalone mixer, the 828es provides 28 separate inputs and 32 separate outputs, including two XLR/TRS “combo” mic/guitar inputs, dedicated main outs on XLRs, and two independent front-panel headphone outs. Connect all of your studio gear, including microphones, guitars, synths, keyboards, drum machines and effects processors. Record, monitor, route, and process all of these live inputs with no latency and no processor strain on your computer. Extensive routing features let you patch ins to outs, or split inputs to multiple destinations. Powerful DSP delivers large console style mixing with 48 channels, 12 stereo busses, and 32-bit floating point effects processing. Add Classic Reverb with lengths up to 60 seconds. Further sculpt your sound with 4-band parametric EQ meticulously modeled after British analog console EQs. Apply conventional compression or the Leveler, an accurate model of the legendary LA-2A optical compressor that provides vintage, musical automatic gain control. From studio to stage, the Mark of the Unicorn 828es delivers exceptional sound quality, state-of-the-art operation and rock-solid performance!